Robert Susz is best known as the lead singer with the 80's soul group The Dynamic Hepnotics. Their group enjoyed considerable chart success with their national hit "Soul Kinda Feelin" staying in the top ten for over six months and winning the 1986 APRA award for most played song on Australian radio. Vocalist, harmonica player and songwriter Susz formed The Mighty Reapers as a spinoff group from the Hepnotics and went on to record a whole series of albums, notably for Rufus Records. The albums featured a wealth of original soul and funk tunes written and co-written by Robert and were released in the U.S. on the Terra Nova label. 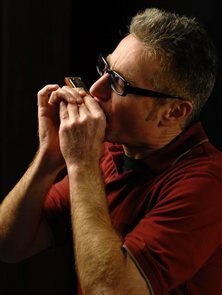 Robert has also played harmonica on numerous recording sessions and is highly sought after in this regard. Continental Blues Party specialises in soul, funk and blues, playing both original material and covers. The band is always in popular demand for club, festival and function work.